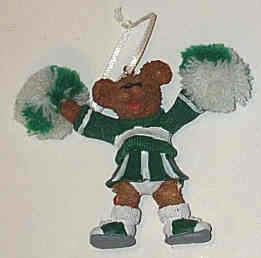 Resin Bear Cheerleader Ornament in Green with yarn pompoms; 3.75" resin bear cheerleader in green and white. The pom poms are made of yarn. This is a great gift for any cheerleader (doesn't have to ..
Resin Bear Cheerleader Ornament in Green with yarn pompoms; 3.75" resin bear cheerleader in green and white. The pom poms are made of yarn. This is a great gift for any cheerleader (doesn't have to be just for the holidays). Can be hung from a rear view mirror or they can hang it in their room. We can also personalize this item with their name. (Across the chest on the white stripe).